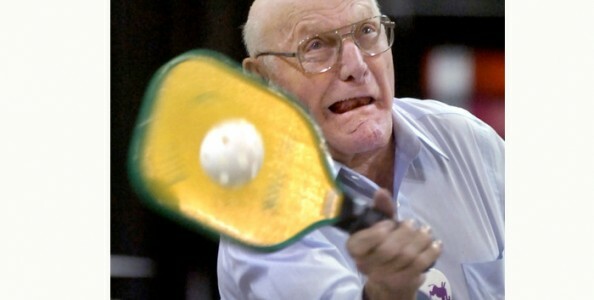 The San Francisco Chronicle is the latest media outlet to repeat the tall tales about the origins of pickleball, the sport that put Bainbridge Island on the map. If you’re a true Bainbridge Islander then you already know the story. For those of you who don’t (Californians, I’m talking to you. You too, Bellevuians, cowering in the back row), pickleball was invented on Bainbridge by Congressman Joel Pritchard and a few of his buddies during the summer of 1963 (according to Joel Pritchard and co-founder Bill Bell), or 1966 (according to Joel Pritchard’s wife, Joan) or 1965 (according to everyone else). That first pickleball court remains shrouded in moss and vines here on Bainbridge. It’s a magic place. When the vines are parted, a chorus of angels can be heard and the court glows with an otherworldly iridescence. The Chronicle, in a recent article about pickleball, got many facts lined up straight. The sport was NOT named after the family dog.